Happy Summer and Happy Wednesday! Today's card is my entry for this week's Summer Card Camp color challenge. Lots of shades of brown and some red. I like it ! I never look in the gallery until I finish my card. There is so much talent in there that instant intimidation happens. I upload my card and then I look at what everyone else has done. By then it is too late to turn back! Even though we are in the thick of summer, I think it is a fun color grouping. After all, we all have a pair of tan shorts and a red shirt or two in our wardrobe. And so does my little summertime gal. 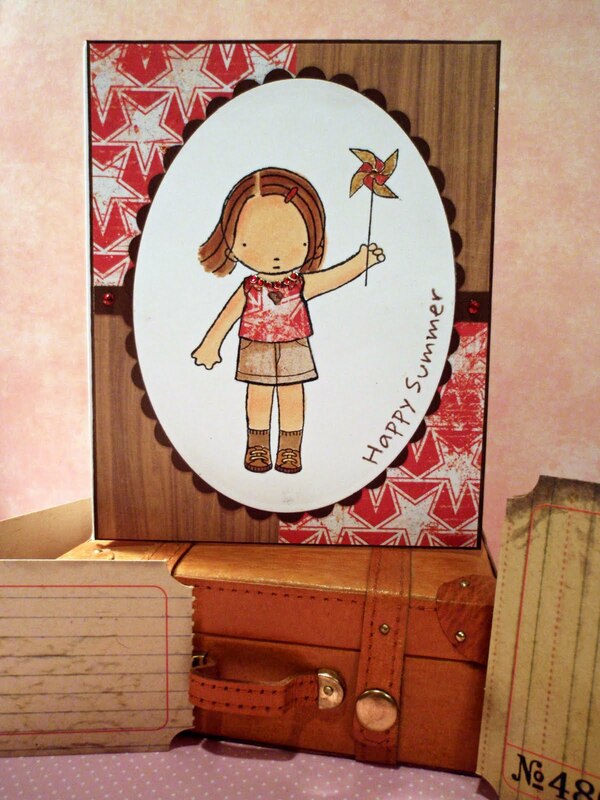 The stamp is a new Pure Innocence from MFT Stamps. The sentiment is in the same set. The fun part about clear stamps is that you can bend them. That's how I got the curve for my sentiment. I colored her with Copic markers and paper pieced both her shirt and shorts. I added some sparkle and then cut out the image with an oval die from Spellbinders. The mat is the coordinating scalloped die. I will be back tomorrow - but now I need to head on over the the gallery and see what all the other students have created. I really like this. Great work!